Astrocamp in less than a month!!! Back in May, I attended my first Astrocamp in the village of Cwmdu near Abergavenny in South Wales. I wrote several blog posts during the camp, and left with a determination to go back for more. Well, bookings opened several weeks ago, and I booked back in to go back to the same pitch. I can't wait. In preparation for camp back in May, I created a tick list of objects that I wanted to try to observe. Now, a little further on in the year, with some of those things now observed and some other constellations around in the night sky, I thought I would tweak that list and update it ready for September. So, here it is. As before, it's quite long, but that only means I have plenty of options. I'm not going to get around them all. I might find 6 over the weekend, I might find more. Who knows? Sometimes, you’ve just got to do it. This weekend has been the start of a 5 day break of work for me. So, with bits and bobs planned, I’ve had the luxury of not really needing to be up and about at any particular time. Except that is for the Great British Beer Festival in London Olympia. But that’s another story. Coming back from London on the train, I had a quick look at the weather forecast, and it showed the potential for some scope action overnight. Slightly jaded, and somewhat tired from the trip to GBBF and a day at the Science Museum, it was going to be touch and go if I could stay awake long enough. Coffee was the answer! Skies were clearer earlier that forecast, so I set the SBT up around 9.30 ish, checked the collimation and had a quick scan about. It was still too light to start any sort of observing, so I left the kit out and returned inside, but by 10pm I was back outside and ready to go. First of all, a quick trip around some targets that I have seen before. Doing this, I find it gives me an indication of how good the conditions are for observing. I’m able to compare familiar targets to how they appeared on previous occasions. Conditions were good, though not excellent to start. There was still a high thin layer of cloud just taking the edge of things, but as the evening progressed and the temperature dropped, conditions improved. The first targets for the evening were the Ring Nebula, the Dumbbell Nebula and the open cluster M52. When observing the Dumbbell Nebula, I thought it was a good opportunity to try out one of my filters. I haven’t used any of my filters with the SBT so thought, again while on a familiar target, that I could try it out. Without the aid of a filter, I felt the best view was given by my 25mm eyepiece. The nebula was distinct, with the rough circular appearance characteristic of it. However, no sign of the shape which gives it its name that it is often present in photographs. I chose the OIII filter and attached it to the same 25mm eyepiece. The difference was certainly notable. Though in practice, any filter reduces the amount of light entering the eyepiece, different filters will block light of different wavelength. So, the overall effect of this particular filter on this target was that the background sky was darkened significantly, without having the same dimming effect on the rest of the nebula. With the filter in place, I was able to see the start of the more traditional shape, now that the nebulosity was sticking out better against a darker background. This was just the start of my play with filters for the evening. In my last post, I referred to the list of the Messier catalogue object which I made in my notebook that I have left to observe. I again referred back to this list for my next two targets. The first of these targets, and the first new tick for the evening was M94, a spiral galaxy in Canes Venatici. Whether it was the seeing conditions still hadn’t settled down, or this object is genuinely tricky to see I don’t know, but I found the target easy to locate, but hard to define. It’s magnitude of 9 is well within the capability of the SBT, but I found it hard to not any structure on it at all. I observed the galaxy at 32mm and 25 mm and could make out the bright core with ease, but little else. Undeterred, I moved on to the second new target, M106. This is also a spiral galaxy in the same constellation as M94. Again, this was tricky to locate, showing its bright core with ease. However, it didn’t appear as bright as M94, but oddly, M106 did seem to show slightly more stretched structure. To try and get as much light from these objects into the eyepiece as possible, I only observed at 32mm. During my last session, I was really pleased with my first observations with the Veil Nebula, but noted that I could only see the Eastern Veil. Tonight though was to be significantly different. In an ever darkening sky, I brought the SBT around to the constellation of Cygnus, and the location of the nebulae that make up the Cygnus Loop. I easily located the star 52 Cygni again, which I did observe previously, but reported that I failed to make out any nebulosity. However, this time, I thought I could make out a slight colour variant stretching through the star and out each side. NGC 6960 goes by a number of names and designations. Notably, the Bridal Veil Nebula, Caldwell 34, the Western Veil Nebula, and the Witches Broom Nebula. It was time to break out the filters again. I did a direct comparison at 25mm with firstly, the OIII filter. I then switched to the UHC (Ultra High Contrast) filter. Out of the 2 filters, this time, I think the UHC filter performed the better. These are the notes I made in my book from the night. The nebular, with the aid of the filters, stepped out of the darkness brilliantly. Both filters in their own ways brought the grey wispy nebulosity into sharp definition from the darkened background of the rest of the night sky. I felt I was on a bit of a role, and decided to look out some other objects not on the Messier catalogue, but that I had heard of previously. So, next, I chose to look for NGC 4490, the Cocoon galaxy. I seemed to take a long time to try to locate the galaxy, though looking seemingly in the right place. According to the charts and my Telrad rings, I could locate Cor Caroli, following it along until I come to the galaxy. I found the galaxy though quite dim, but couldn’t for sure say that this was correct. The star atlas say that I should also see NGC 4485, a magnitude 12.5 galaxy in the same vicinity. I think I could make something out the prime target, but more of the appearance of a lightly smudged star. The two galaxies apparently look like there are interacting in some way. However, because of the low elevation of the target in the sky, I expect that conditions were hampering the quality of the observation. Nevertheless, I had seen enough to convince myself that I was looking at the correct galaxy, especially when re-referencing back to my Telard chart and sky atlas. Time was now pressing on, the bells in Ross had rung for midnight some time ago. The temperature had dropped significantly, and there was a heavy dew on the lawn. I’m pleased to say that this didn’t seem to effect the performance of the telescope through the evening, but did give an indication of how much moisture there was in the atmosphere. I decided to call it an evening around 1am and retire to bed. Though I hadn’t observed lots of targets, the ones I did were important. Put together with the experience of using the filters with the SBT for the first time, I feel I now have a bit more idea of the circumstances I can use them. All in all, an excellent night with some good quality observations. The SBT Comes out to play! As we amateur observers drag ourselves out of the 2 month hibernation that is indicative of the Summer in the UK, we look forward to true astronomical darkness eating into our evenings. Signs of darker evenings are always welcome in this household, though the neighbours will once again be holding their heads to their windows with hands cupped around the eyes wondering what on earth is going on in our garden as some loon sits down reading books and charts by red torch light in the freezing cold. 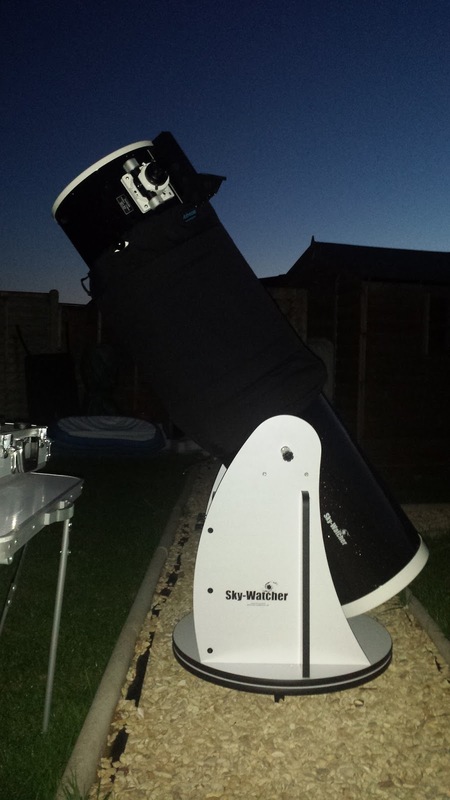 Well, last night, the SBT broke its summer imposed observational blindness as it was unleashed for the first time under a clear and almost dark Summer night sky. I can’t go much further without mentioned the coming Perseids, for these were the initial main reason I wanted to get under the stars. This year’s display is set to be a good one, with the moon rising not long before sunrise allowing for good dark conditions throughout, only the weather and cloud cover to overcome. The nights running up to the maximum ZHR have been forecast to be good for observing, although the night of 12th August might not be so great. Nevertheless, an opportunity not to miss. I hadn’t done much in the way of pre-planning for this session, so was happy to just re-acquaint myself with the night sky and visit some targets ad hoc. A brief check on collimation, and some Telrad alignment, and all we set to go by 10pm BST. The air was dry, and clear which gave some excellent observing conditions. Looking to the West, the last daylight seemed to drag its heels and take an age to finally disappear over the horizon. Looking up, Cygnus was high in the sky, almost directly above and presents it’s rich array of targets. I decided to pick out a favourite of previous times when using the 150p, M57, The Ring Nebula. Even though there was still a considerable amount of daylight in the sky, the SBT helped me pick it out quite easily. I’ve always found finding M57 straight forwards because of its position. The contrast between it and the background sky did mean that picking out the central star was almost impossible. But, the fact I could see it was pleasing. So, from planetary nebula to globular cluster, and M56. It’s a small cluster, fuzzier compared to others making the resolution of individual stars very tricky. I thought the 12mm BST give me the best view of the cluster. Even though I have seen this cluster before, I don’t really recall it so wouldn’t exactly call it a memorable target. Then again, M is for Messier and not Memorable! On the last page of my notebook that I wrote on, I took the time to list the remaining Messier objects and their constellations that I have yet to locate and observe. This proved to be an inspired decision because it gave me an easy source of information of what to observe next. And, with the added bonus of them being new ticks. Next on the list for the evening, and the first new object was the open cluster of M39. This took quite a bit of time to locate, which was surprising given how bright the cluster actually appeared when I did locate it. It’s a really pretty, yet sparse cluster with perhaps around 3 dozen stars easily resolvable. Due to its location in Cygnus, against the backdrop of the Milky Way, the edge of the cluster melted into the surrounding stars. The next new tick took me to the constellation of Pegasus. M15 is another globular cluster. From my observing location, I had to line the SBT up, pointing between the gap in houses to get the target in the eyepiece. The cluster is quite small and has a very dense core and at 12mm, I could start to resolve possibly hundreds of pin pricks of individual stars in the cluster. Another new target to add to the list, and on to the next. In a move away from that area of the sky, I moved the SBT around and pointed it towards Ursa Major. The next target was M97, a planetary nebula called The Owl Nebula. The nebula itself I picked up quite easily. But, because of conditions and the neighbours’ kitchen light, I found it hard to make out the supposed dark areas of nebulosity to form the eyes of the owl. At magnitude 11, the SBT picked it up well though. Finally, and annoyingly because it was a school night and conditions were superb, the next target was never something I thought I would get to see. The notes for the target in the book start… “Ding Ding Jackpot….” I decided to push the SBT back around to Cygnus and pop the 32mm EP back in. The Veil Nebula. A lovely contrast of grey nebulosity arching across the entire field of view of the eyepiece. There are 3 distinct regions to the Veil Nebula. The Eastern Veil, the Western Veil and Pickerings Triangle. I had picked out the Eastern Veil. Though I seemed to find it quickly, I did find it hard to return to when moving the scope around to try and work out the extent of it. I know a large field of view was needed, so I kept the 2 inch 32mm EP in place. However, an OIII filter would have helped bring the nebula out more, but my OIII filter is only 1.25”, so too small. There are 3 targets making up the Eastern Veil, NDC 6992, NGC 6995 and IC1340. The Eastern Veil is also catalogued as Caldwell 33. Apparently, the Western Veil is supposedly easier to see, but I did struggle, and indeed, failed to pick it out. I did see the star designated 52 Cygni repeatedly as I scanned the area, but couldn’t make it out on this occasion. Next time, with more accustomed night vision, I hope to pick it out. And that brought an end to the session. Some excellent ticks and an absolute highlight of locating the Eastern Veil. So, thanks for reading. Another post will be filed soon enough with news of AstroCamp in September, and the inevitable construction of a tick list of targets, only for hopes to be dashed with rubbish weather!